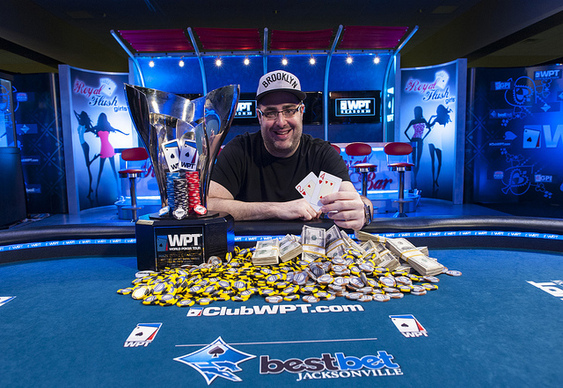 Jared Jaffee ended yesterday's WPT Jacksonville final table as strongly as he started it and eventually walked away with the title and $252,749. Having started the session with an imposing chip lead, Jaffee made light work of his fellow finalists to claim his first WPT trophy. In total it took four hours and just under 100 hands for Jaffee to clinch his maiden win, but every great adventure starts with a single step and for Jaffee that meant the elimination of Johnny Price. One of the shorter stacks at the start of play, Price made his move with pocket tens early in the session but found himself in trouble when Jaffee called with pocket aces. With one elimination under his belt and the finale barely a few hands old, Jaffee was soon pushing the pace once again when he made a move with pocket nines. On this occasion Corrie Wunstel was the player trying to catch the chip leader but after a disappointing board failed to improve his Ac Jd he was sent to the rail in fifth. Blake Purvis was the next person to assume control of the eliminations as Margo Costa and Michael Horchoff reluctantly relinquished their chips. With only two players left it was now the turn of Jaffee and Purvis to do battle. Sitting almost even in chips it looked as though Jaffee would be in for a tough fight, but once he edged his way in front he never looked back. Indeed, after 40 hands the match was brought to a close after Jaffee's 4h 2h was able to out race Purvis's pocket aces. Having watched the dealer present a Jd Jh 6h flop, both players put in a series of bets, but by the time the Qh fell on the river it was all over for Purvis. With the final pot pushed towards Jaffee he was finally able to crack a smile thanks to a dominant final performance.